How do you add value to Free? Home / Blog / How do you add value to Free? No, the title isn’t a Zen koan — although, if you do obtain some enlightenment from reading on, we’ll gladly accept credit. Rather, we’d like to pick your minds about something. See, lately, we’ve had a lot more readers find (tweet, share, comment on) The Saylor Journals…and that is awesome. As more people swing around and lend us their eyes for a few minutes, this blog better serves its role as a mouthpiece for the Saylor Foundation. But now the question becomes: what can we do to better serve our current and future readers? Put another way, how can we invite the Saylor.org community to spend some of their time reading and sharing here? 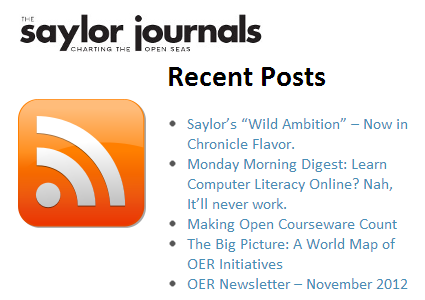 Add a ‘Blog’ link to the Saylor.org footer (do you detect a theme? With that, you can share any and every blog post to your favorite social network platform or even just email it to yourself to read later. We’ve also got this classy orange RSS button up top, near the search bar. This button takes you to our FeedBurner page, where you can subscribe by email or add our URL to your favorite feed reader app. Offer your thoughts in the comments, via the Contact link, by direct email, or on any of our social media properties. Our mission is to give quality, free online courses to the world, but our dear desire to to make this all fun. ‘Free’ is just the price tag; the real value in all of this lies in anything and everything the community can gather from it. Let us know how to help!